Editor’s Note: The U.S. Fish & Wildlife Service is considering using rodenticides to eliminate non-native mice from the Farallon Islands. While Golden Gate Audubon generally opposes the use of rodenticides, we are supporting the use in this case because it is the only way to protect the native species of the Farallones. This post is reprinted from the newsletter of Marin Audubon, which also supports the mouse eradication campaign. In August, the U.S. Fish and Wildlife Service released its draft Environmental Impact Statement (DEIS) on eradicating introduced house mice on the South Farallon Islands. MAS supports eradication of the non-native house mice to restore the ecosystem of the Farallones. If action is not taken to rid the island of mice soon, all of the Ashy Storm-Petrels and probably Leach’s Storm-Petrels could be lost. 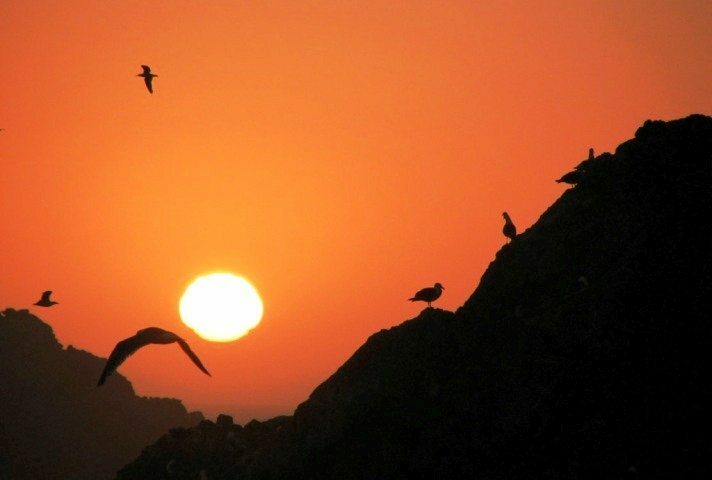 The Farallon Islands National Wildlife Refuge, 30 miles outside of the Golden Gate, is a seabird breeding habitat of worldwide significance. 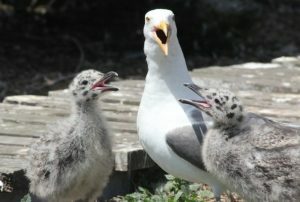 The Refuge comprises the largest nesting seabird colony in the contiguous U.S. outside of Alaska, including half of the Ashy Storm-Petrels in the world and the world’s largest breeding populations of Brandt’s Cormorants and Western Gulls. Removing non-native mice would restore the island’s ecosystem for native species. The primary beneficiaries would be Ashy and Leach’s Storm-Petrels. House mice originated in Asia and were brought to the islands, along with cats and rabbits, via ships during egg gathering and during lighthouse and military operations in the early 1900s. The cats and rabbits were removed in the 1970s, leaving the house mice as the only non-native mammals. Mice are omnivorous. On the island they eat the Maritime goldfield (a plant), the endemic Farallon camel cricket, and the Farallon arboreal salamander, reducing the populations of these native species and further disrupting the island ecosystem. Scientists have also found evidence of mice preying on petrels (missing toes and legs). In spring on the South Farallones, house mice can reach plague-like densities of 490 mice per acre, among the highest found on any island in the world. Scientists have observed that it can appear as though the ground itself is moving. Burrowing Owls are among 400 different land bird species recorded on the islands since 1968, when PRBO/Point Blue began to study birds on the islands. Most of the owls stop to rest and depart within a few days. Finding a ready source of food in the mice, however, some owls remain. When the mouse population naturally declines in December and January, the owls leave, die or shift their predation and diet to feed on the small storm-petrels. Vulnerability of the petrels is heightened by the fact that they arrive at night when the owls are most active. Owl predation on storm-petrels is well documented. Storm-petrels show up in owl pellets in January after the mouse population crashes. In recent years some 90 percent of the owl pellets collected after February 1 contained storm-petrel remains. Surveys show that the owls consume an average of 225 storm-petrels annually. Predation has increased in recent years. If house mice were no longer present, it is anticipated that the owls arriving during the fall, when the storm-petrels are either present in very low numbers or not at all, would have little motivation to stay. The USFWS considered forty-nine alternatives to address the problem. It determined that the broad-scale application of rodenticides is the only proven method to rid a large island such as Southeast Farallon of the house mice. Rodents have been successfully removed from 500 islands worldwide; more than 90 percent of the removals used rodenticides. A. No-project alternative, which would have no benefit to the island ecosystem. B. Use of bait with Brodifacoum-25D Conservation. C. Use of bait with Diphacinone-50 Conservation. These anticoagulants are registered with the EPA for conservation use. They vary in the length of time to take effect, their potency, and half-life in the environment. Brodifacoum was developed for drier climates such as the Farallones. Diphacinone has been used on a number of other islands but not for mice. Application would be in the form of pellets made up of grains. The USFS has not yet decided on a preferred alternative. The program proposed by the USFWS includes precautionary and mitigation measures. Application would be timed for when the seabird population is at its lowest — between August and January, most likely early November. Seed would be broadcast by helicopters rigged with special bait buckets to direct pellets to target locations and with motorboats for areas that can only be reached by water. Bait release stations would be used around houses and for hard to reach places such as steep cliffs. Only qualified persons would apply the bait. Tested hazing methods would be used to scare away Western Gulls, the species most at risk. Methods would include lasers, spotlights, air cannons, and predator calls. Seabirds are not at risk because they eat fish, not grain. Burrowing Owls would be trapped and relocated to the mainland. Native salamanders would be collected until the risk of exposure is over. Carcasses would be removed to avoid the threat of exposure to non-target species. Any remaining bait pellets would be crushed or removed. Bait would be deposited away from the water line. Studies have shown that even if some bait drifts into the ocean, the levels would be undetectable and not harmful to other wildlife species. Monitoring for mice would go on for several years afterward. Measures to prevent the reintroduction of the mice to the island will be implemented and will include using traps, requiring use of mouse-proof containers, and inspecting all vessels landing on the islands. The DEIS shows that the Fish and Wildlife Service’s process has been careful, thorough and based on the best available science to determine how best to remove the mice and restore the Farallones with as minimal damage to the environment as possible. For general information on protecting seabirds at the Farallones, see www.restorethefarallones.org, a site run by US FWS, Island Conservation, and Point Blue Conservation Science (formerly PRBO).You can read the full DEIS for the South Farallon Islands Invasive House Mouse Eradication Project at www.regulations.gov (docket number FWS-R8-NWRS-20113-0036). Or click here to read the FWS’ short press release on the report. Local conservation groups that are supporting the mouse eradication program include GGAS, Sequoia Audubon, Marin Audubon, Point Blue Conservation Science, the California Academy of Sciences, the Institute for Bird Populations, and Save the Bay. You can submit comments on the mouse eradication plan through December 9, 2013. For how and where to comment, see http://www.gpo.gov/fdsys/pkg/FR-2013-10-25/pdf/2013-24954.pdf.